Eva and I have a container garden! We have tomatoes, peppers, basil, zucchini and mint in the works and some cilantro, spinach, and marigolds just seeded. This new obsession was a Mother’s Day gift from a wonderful friend. I check the plants every morning. Eva talks to her marigold seedling. I love breathing in the gentle scent of mint on our deck with my morning coffee in hand. It might be my new form of religion. Anyone surprised I’m taking up gardening? I don’t like getting dirty. I wear dresses and heels nearly every day of the week. But a bag of potting soil and a couple of seed packets really get me excited apparently. Let’s call it another manifestation of embracing motherhood and the changes it has wrought in me. These plants are an investment of time. I have to remember to take care of them! Let’s hope we can last the next 30-50 days until harvest. I can’t wait to see Eva’s excitement over out first tomato fruit or a batch of homemade basil pesto. Seriously, that is going to be a thrilling mommy moment. 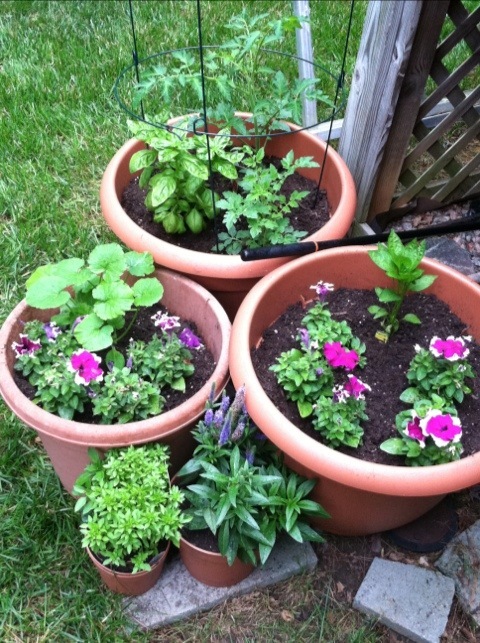 This entry was posted in Gardening, Parenting and tagged Gardening, Green, Outdoors, Summer, Sustainable Living by abbyandeva. Bookmark the permalink. Right?? I am planning on making pasta tonight so I can use the basil for the first time. CANNOT wait for my first little tomato! Add a little fresh mozzarella and I’ll be in business! I really want to plant stuff, but I have nasty habit of killing nature!! So do I! But I was assured by my friend that we started everything properly so I need only water it to succeed. Crossing my fingers! I never started any plants this season. I may desperately need your advice in the future to tell me what to plant when. I’d just love to grow a few veggies. Yes! Just a couple veggies plants is really where I’m at too and I can’t wait to have more! It is probably the best hobby I’ve ever attempted! You let me know, lady!